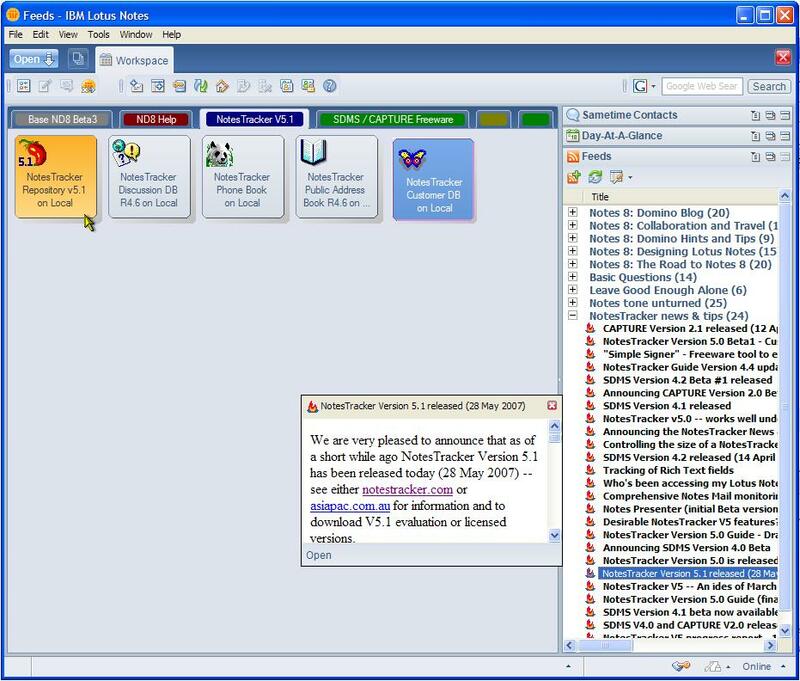 On Friday 17 August, 2007, IBM announced the release of Lotus Notes 8 and Lotus Domino 8. This comes after some two years in development, and includes a completely redesigned, flexible, modernized Eclipse-style client interface. The IBM press release for Lotus Notes 8 and Lotus Domino (ND8) can be found here and the main product page is here . This is the result of some two years of development (under the code name Hannover) using Lotus Expeditor, which is IBM's Eclipse-based universal managed client software for extending "composite applications" to laptops, desktops, kiosks and mobile devices, see this page . In one fell swoop this moves Notes from being a closed application development platform to being quite an open one. This promises a revolution in the type of applications that can be integrated into Lotus Notes, and it can well and truly puts the knocker on the oft-heard claim that "Notes is Dead." Indeed, IBM has plans for enhancing Notes and Domino for quite a few releases to come, thus keeping the pressure on arch rival Microsoft to similarly improve and extend its panoply of collaborative and information worker products (SharePoint, etc). Such healthy competition is good to see. IBM is also offering a so-called "basic" Notes client having the familiar look and feel from previous releases, but I'm sure most users will be keen to shift across to the new client as soon as they lay their eyes upon it. The many user interface usability improvements and the excellent new features like RSS feeds and IBM Sametime instant messaging (built into a new Sidebar) plus the ability to integrate a wide range of powerful WebSphere-style "composite applications" mean that this new rich Notes client is altogether compelling. ND8 builds on an exceptionally good foundation. During my fairly long career at IBM Australia, I had an epiphany of sorts when I was fortunate to be given the responsibility way back in August 1978 to learn all about the IBM System/38 and provide technical support for that highly-innovative system once it was announce in October of that year. The superlative System/38 architecture, with many enhancements and extensions, is alive and well 29 years on the in the form of the IBM System i -- the latest name for what was previously branded the IBM Application System/400 (AS/400) and then the IBM iSeries. I had a second epiphany in 1993, not long taking up an early retirement package from IBM that was "too good to refuse", when I first saw Lotus Notes Release 3 demonstrated. At first encounter, I could see the innovative architectural aspects on Notes Client and Server: flexible document model, replications, security, etc) that still underpin the new ND8 release. (The server component was rebranded as "Domino" at Release 4.5 time, chiefly to signify its embracing of all things Internet-related.) For an in-depth examination of the Notes/Domino architecture, presented as a series of layers radiating out from a central core of operating-system-style services -- object store, security, replication, directory services, and more -- see the IBM developerWorks article "Notes: A sustainable platform architecture here . How things come and go! Back in 2003 (or thereabouts) IBM definitely lost its way with respect to how the Lotus products fitted in with the then IBM overall product strategy. They released a seminal white paper called "The IBM Lotus Software Technical Strategy and Domino Developers' Roadmap" (not surprisingly, I no longer can find a link to it on the IBM website) which greatly confused, perplexed and upset the Lotus Notes community. This paper articulated the then official IBM position, "IBM's vision for the future of collaboration and the extent to which current Domino applications and developer skills can be reused and leveraged in the next generation of collaborative applications. It explains IBM's plans to continue investment in Lotus Notes and Domino as a complementary and parallel architecture to IBM WebSphere ..."
The result was that dedicated Lotus user and IBM business partner community thought that IBM had abandoned Notes, in favor of IBM WebSphere and IBM "Workplace" (the latter term in itself seemed to have several connotations). Thankfully, during the past couple of years, with Release 7 and now Release 8, IBM is steering the ship in the right direction and the user community is reinvigorated. Another aspect of all this is that the Notes client was originally designed to run on multiple platforms (OS/2, Windows, Macintosh) and suffered somewhat from the "lowest common denominators" effect, a common complaint being that it did not provide Windows users (the bulk of the installed base) with the total look and feel of other familiar Windows applications. Also, because the Notes client user interface design had remained relatively static for ten years or more, some pundits felt that it was getting rather long in the tooth and took this to mean that IBM wasn't putting any significant investment into Notes (hence the "Notes is dead" clamor). It's likely that the jazzy new Notes 8 client will put paid to such opinions. UPDATE: The Reviewer's Guide: Lotus Notes and Domino 8 provides a reasonably detailed description of the new features and enhancements in ND8. It's intended for Lotus Notes business users, Lotus Domino IT managers and system administrators, and Lotus Domino Designer application developers.